In 1979 a group of local business men, academicians, and concerned citizens met with members of the Manchaca Optimist Club. The members of the Manchaca Optimist club provided insight into the Optimist organization. The non-profit model offered, provided what persons in attendance deemed as a pathway to address some of their concerns. 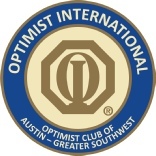 In June of that year, the Greater Southwest Optimist Club (GSWO) was chartered with 41 Charter members by Optimist International and subsequently incorporated as a non-profit organization in the state of Texas. It was a non-traditional club in that most Optimist Clubs at the time dealt primarily with sports and sports programs – Little League Baseball etc. The GSWO chose to make scholarships and education support as the central program of their efforts. The sources used to finance the scholarship program have varied over the years. From the initial sources of: Aqua Fest – fajita sales, The fajita Cook-Off – which had as honorary sponsors – Darrell Royal, Admiral Bobby Inman, and Peach Sales. To the more recent sources that include: Scholarship Fundraising Banquet, Annual Scholarship Golf Tournament, Coushatta Casino Excursions, Super Bowl Raffle, and the upcoming First Annual Valentine’s Day dance which will occur February 13th at the Onion Creek Ballroom. While education is the primary goal, other youth programs such as the Annual Gardner Betts Juvenile Detention Center program, the Houston Elementary School Annual Christmas school program, the Oratorical Contest, the Essay Contest, and the Youth Appreciation Week programs, Respect for Law, are also supported. The GSWO club has sponsored many youths in these programs and some that compete at the state and national levels. The dedicated GSWO membership continues tireless efforts to help students achieve their educational goals…..and provide programs that benefit the youth in our community. They are indeed involved in educating the Leaders of tomorrow.